BOSTON (AP) — Maple Leafs forward Nazem Kadri temporarily went to the locker room after a knee-on-knee hit from Jake DeBrusk in the second period. 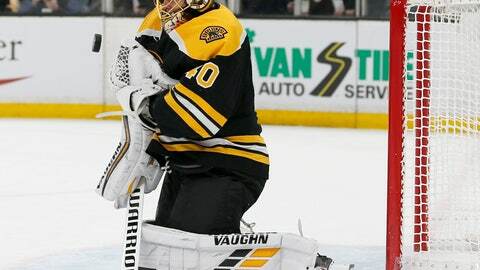 Kadri drew a game misconduct for cross-checking DeBrusk in the face , leading to Boston’s final goal, and Tuukka Rask stopped 30 shots to help the Bruins beat Toronto 4-1 on Saturday night and tie the first-round playoff series at one game apiece. Two nights after Toronto beat Boston 4-1 in the opener to steal away home-ice advantage, the Bruins took a 3-0 lead with a 29-16 edge in shots on goal into the third period. Brad Marchand, Patrice Bergeron, Charlie Coyle and Danton Heinen all scored for the Bruins. But the main event was DeBrusk and Kadri, who mixed it up all night before Kadri took a shot at him with about six minutes left in the game, drawing a game misconduct. Bergeron scored a minute later to make it 4-1 and clinch it. He was sent off for hooking, and he came back on the ice just in time to sneak up on David Krejci from behind and poke the puck away before Kadri was knocked to the ice by a knee-on-knee hit from DeBrusk. Muzzin also knocked Bruins defenseman Torey Krug out of the game with a hit against the boards.